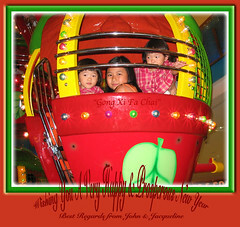 Chinese New Year or the Lunar New Year for 2009 started today, January 26! It is the Year of the Ox. To all the Chinese people and others celebrating this auspicious season, John and I would like to wish you and your loved ones a very happy new year filled with much joy and peace, success and prosperity, and good health too! Enjoy your holidays and have great bonding times with family, relatives and friends. Read more about this Spring Festival at wikipedia and infoplease.